Copyright: You grant organizers the right to use the entry only in connection with the execution and promotion of the See.Me Art Takes Paris contest and the See.Me website and services. Entry fee: $29 for Peoples Choice; $69 for Grand Prize (maximum of 25 images). 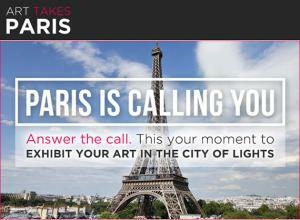 Art Takes Paris is an open call for a chance to showcase in the city of lights and gain the attention of the international art world. This is your chance to position yourself amongst an impressive community of A-list Parisian galleries and artists, and widely respected international patrons and art collectors. The top selected artist will be awarded a featured exhibition in Paris, $10,000 total cash (includes a $5,000 grant to produce new work and a $5,000 cash prize), a publicity campaign around your work in both Paris and New York and an online feature promoting your workinternationally. The public will cast their vote and the highest rated portfolio will receive the People’s Choice Award: $10,000 cash and an online feature promoting your work internationally. The winner will be announced before/on October 15, 2013. Online submissions via the website, you are limited to 25 images per portfolio.